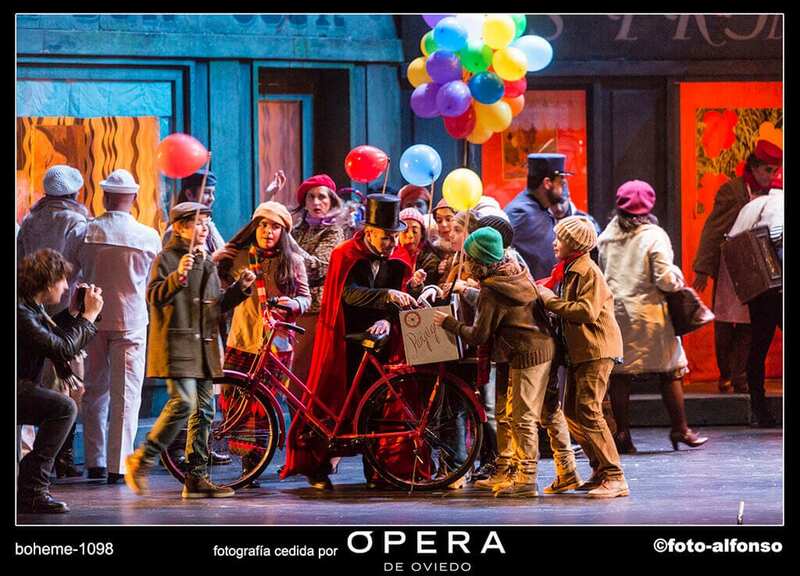 After Nabucco in October, the Campoamor theatre (Oviedo), a rich programme followed concluding with Giacomo Puccini La Bohème. The librettists Giuseppe Giacosa and Luigi Illica joined the different episodes of the serial Scènes de la vie de bohème (1845-49) by Henry Murger and turned it into a four act opera. The action takes place in the winter of 1830. The poet Rodolfo, the painter Marcello, the musician Schaunard and the philosopher Colline live poorly in an attic in the bohemian Latin Quarter of Paris, but they have the strength and humour peculiar to youth. 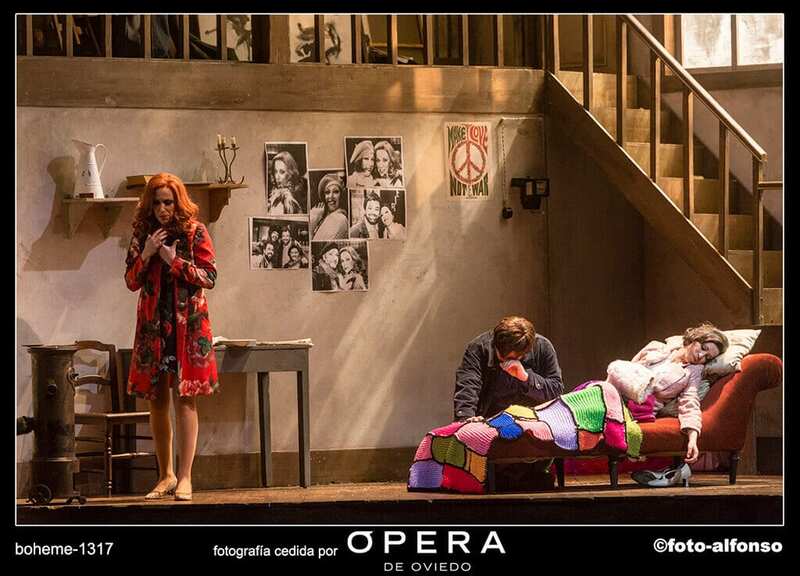 La bohème,directed by Emilio Sagi, sets the scene of a realistic and colourful early 1970’s. In this production, Sagi modernizes his discourse by reclaiming gender rights consciously. The end of the second act mixes a feminist protest with the military parade, placed among the people crowded in the Latin Quarter. Placards demanded: “Equal pay for equal work”. At the same time, the way he deals with the female protagonists, Mimì and Musetta, is a significant change: the languid and weak Mimì —to whom we are used to because of the operatic canon— is replaced here by a woman that takes the initiative to meet Rodolfo in the first act and flirts with him in an elegant and charming way while she sings her aria “Si, mi chiamano Mimì”. Sagi accomplishes this transformation by using small dramatic changes, and the musical conductor Marzio Conti follows this idea beautifully from the orchestra pit, achieving a united and coherent discourse both in the stage action and in the musical part that worked very well. Regarding Musetta, Sagi uses the red colour for her wardrobe to define an attractive, likeable and coquettish woman who defends her liberty over obedience to men. 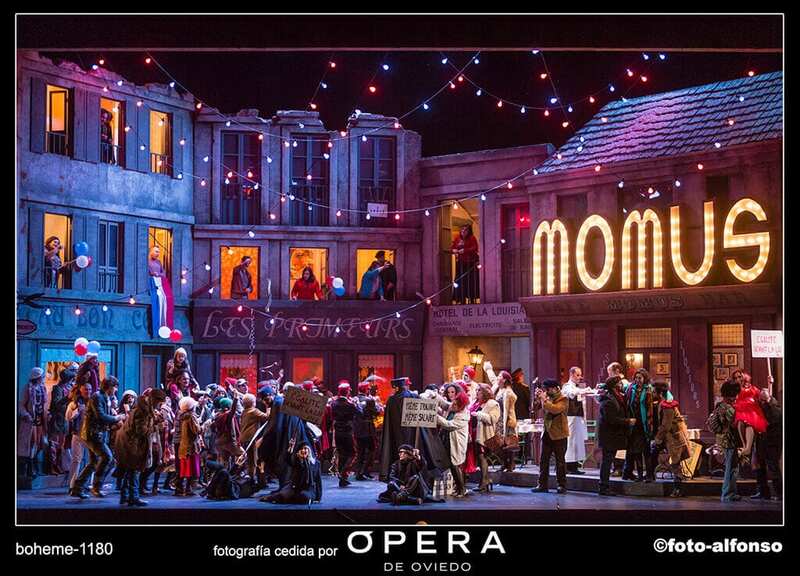 In the orchestra Marzio Conti conducted a passionate Bohème efficiently, although sometimes, the Oviedo Filarmonía overpowered the singers’ voices during the first act. However, the conductor soon achieved the appropriate balance between voice and orchestra. The outcome is a wonderful balance, which teases out the dramatic scenes and emphasises the musical phrases and famous arias. For instance, the funeral march sung by Colline in his aria “Vecchia zimarra, senti”. Here, the bass Andrea Mastroni offered a moving Colline with a beautiful and well-projected voice. The Italian tenor Giorgio Berrugi stands out in Rodolfo’s role with his beautiful timbre and phrasing; the audience clapped at his interventions, particularly the well-known aria “Che gelida manina!”. 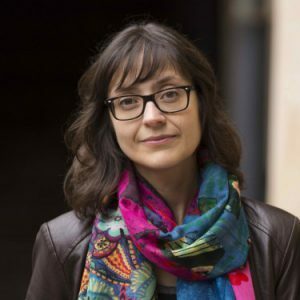 Erika Grimaldi’s Mimì, despite her good singing with its power highlighted in the fourth act, does not seem to have the most appropriate voice for the part maybe because her voice exudes more of a metallic feel. Nevertheless, Grimaldi offered a moving performance. 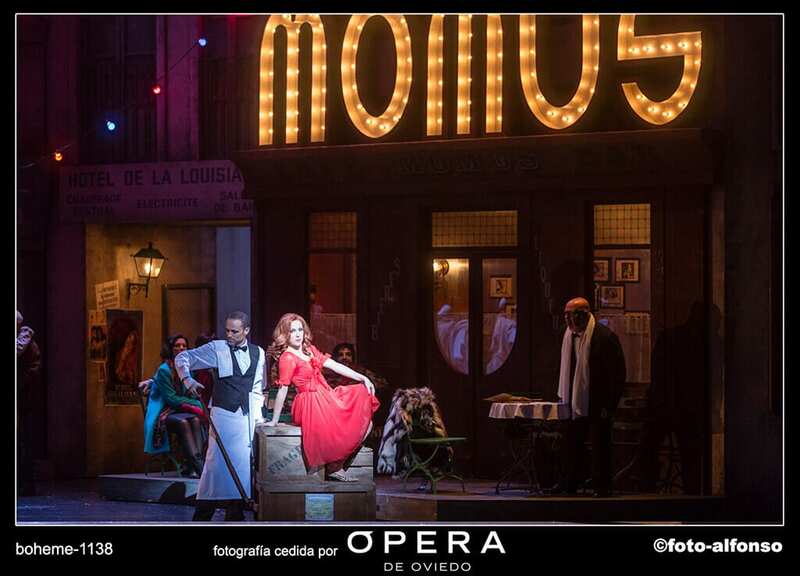 Carmen Romeu’s Musetta has difficulties with high notes; still, she is a convincing Musetta. However she is a better actor than a singer. Damiano Salerno’s Marcello is right, as is Miguel Sola (Benoît / Alcindoro) who stands out in his comic facet. The choir is really excellent, particularly in the women’s voices and the children’s ensemble. Cast includes: Giorgio Berrugi, Erika Grimaldi, Damiano Salerno, Carmen Romeu, Andrea Mastroni, Manel Esteve and Miguel Sola.